Good health was vital to the pioneer, and he went to extreme lengths to keep himself fit. When measured by present-day standards, he was not a healthy man, and he had a very limited knowledge of better health practices. However, he did have strange beliefs, antidotes, a considerable stock of remedies, and even health superstitions. Since these were all he had to guide him in the matter of health, he followed them. As spring came each year, the pioneer began to look about for a spring tonic. This might vary from a mixture of sulphur and sorghum molasses to sassafras tea and sallet. He believed that his blood had become thick during the winter and needed to be thinned, and that his system needed cleaning out. There were accepted ways in which these objectives could be accomplished. He could take sulphur and molasses, though this popular remedy seemed to have been reserved mostly for youngsters. Another common and less objectionable remedy was sassafras tea, which people drank in copious amounts each spring. 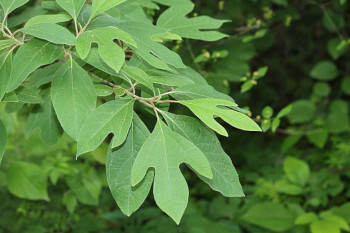 They thought sassafras tea was an eflfective blood-thinner particularly so when made from the roots of red sassafras. To assure the best tea, the roots were dug in early spring while the trees were dormant; that is, before the sap had begun to rise. Some insisted that roots should be taken only from the north side of the tree. Some even held that those dug during the dark of the moon were more flavorful. All alike agreed that roots from more mature trees, three inches or more in diameter, were more aromatic. Digging sassafras in early spring became almost ritualistic. Only the rough outer bark of the roots was removed. Larger roots were split rail fashion, and diggers generally discarded the central portion of larger sections. When properly gathered and stored, roots retained their flavor for weeks. Properly brewed and allowed to settle, the tea had a most attractive rosy tint. The scent of brewing tea filled the house with a delightful odor. A similar drink was made from the broken twigs of the spicewood bush. The writer once drank some of this tea in a home that rated it above the sassafras drink. The lingering memories of this one experience, however, are dim among the more vivid ones of sassafras brew. Sulphur and molasses and teas from sassafras and spicewood hardly were sufficient to fully thin the blood and clean the system. A supplement of wild greens, or sallet, was necessary. This yearning of the pioneer for green food is not difficult to understand. There were no frozen foods and no fresh vegetables from the South. The first green vegetables that the pioneer could have were those that grew on the farmstead, in the fence rows, and about old fields, where the housewife went to gather sour dock, pokeberry, lamb’s quarter (generally pronounced lam-squarter), dandelion, narrowed leaf plantain, wild beets, wild lettuce, young sprouts of elderberry, wild onion, and perhaps other plants not presently popular.